A good asphalt maintenance program can help prevent costly "remove and replace" projects, especially for property owners in Medford. 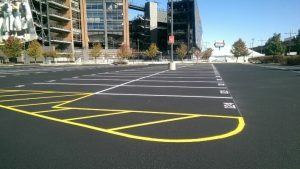 By having cracks repaired promptly with Sealcoating, Medford, NJ, and add years to the useful life of your parking lot. Although Medford, NJ does not routinely receive the bitterly cold winters and massive snowfalls that are common in Buffalo, New York, or the scorching summer temperatures that are frequent in Tucson, Arizona, extreme weather can occur -- and has occurred. Neglected parking lots can suffer tremendous damage should a winter prove to be unusually harsh or should the summer deliver higher-than-normal temperatures or torrential rains. At Asphalt Pavement Solutions, we understand the need to minimize the length of time an area must be closed to traffic for maintenance or repair. We never use sub-contractors for our jobs, which means that we can schedule our crews to minimize your inconvenience. We have more than three decades of experience in the asphalt industry and currently provide our services to clients in New Jersey, Pennsylvania, Delaware, including some of the most well-known retail chains and property management companies. Whether you need parking lot striping, parking lot maintenance or asphalt repairs in Medford, contact Asphalt Pavement Solutions at 856.288.1656, to discuss your asphalt needs. If you prefer, you can use our online form to request a free quote. Asphalt Sealcoating - Protecting your asphalt begins with a quality asphalt sealant within one year of installation. The long term maintenance of your asphalt can greatly extend - even double - the life of your pavement investment. Learn more about sealcoating, Medford, NJ. Crack Repair - Crack repair is critical to the life of your pavement. When cracks appear, water penetration begins to deteriorate your pavement’s structure. Asphalt crack sealing can put an end to water penetration and add many years to its natural life cycle. Learn more about Crack Repair in Medford, NJ! Asphalt Repair - Over time, asphalt becomes brittle and begins to deteriorate no matter how much maintenance you perform. When this occurs your asphalt may be nearing the end of its life-cycle. By performing asphalt repairs such as pothole repair and patching, you can continue to extend its life. Learn more about Asphalt Repair in Medford, NJ! In addition to these critical maintenance and repair services, we also offer parking lot striping, traffic sign and bollard installation, ADA compliance consultation, concrete installation/repair and more. If you are located in Medford, NJ, you can rely on our 30+ years of pavement maintenance experience to address your parking lot needs! Call 1-856-288-1656 today!